This program has few startup options (below). -h or -H Get help, either the short version (-h) or the long version (-H). -v or -V Use verbose output. ID must exist in the GLM model and have type “k2”. -T [ID] Calculate the optimal value of the time constant for a gamma or sigmoidal k2a term that models displacement. Test both gamma and sigmoidal functional forms, as well as a shaped gamma function with a non-unity alpha shape parameter. The ID specifies the event name in the GLM model; an event with that ID must exist in the GLM model and have type “k2a”. After running the program as above, display using jip-display from the same directory. You may want to add options to the “.display” file. 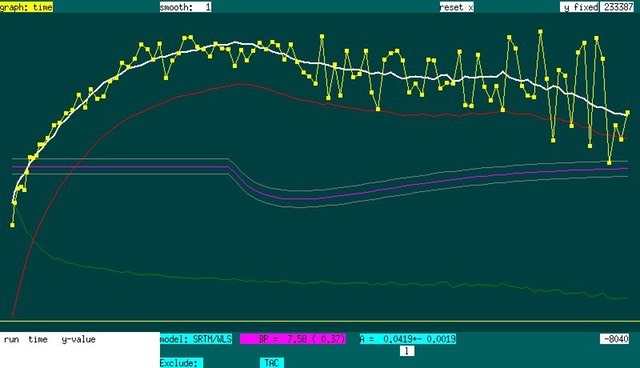 Time-activity curve from a single voxel in basal baglia showing displacement (purple line, with gray error bars). Yellow points = data, white line = total fit, green & red lines = components of fit. Values of parameters and conditions are evaluate for single voxels or ROIs.